You are here: Home / Shop PGH / Pittsburgh Businesses / Thread Needs Your Vote! Please take a moment to help this awesome Pittsburgh startup (yes, Thread is a business not a non-profit) win $25,000 dollars. Thread, a social venture start-up headquartered in Pittsburgh, PA, takes waste from the poorest places in the world and transforms it into dignified jobs and responsible fabric. This week, Thread is in the running to win $25K in theLedbury Launch competition with a public vote. Each vote brings us one step closer to the sweet taste of victory (and much needed capital to help Thread grow our impact in Haiti). TODAY, June 24, 2014 – is the LAST DAY TO VOTE! Only 1 vote per email address, so dust off those old AOL addresses to vote twice and share the link (bit.ly/voteforthreadbury) with your friends, coworkers and family. 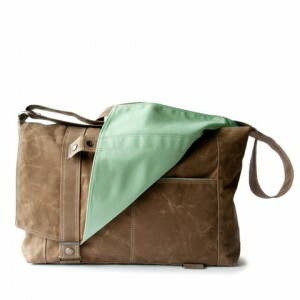 Check out the latest bags, that are made in Pittsburgh by Moop with a lining made from Thread’s recycled bottle fabric. I was going to write a long-winded paragraph about why Thread is awesome and why it is important to vote for them, but my friend and incredible Pittsburgh artist wrote this Facebook post that does a much better job of summing up the situation. Hey Pittsburgh massive and outlying territories. As I understand it the purpose of living in large organized societies is that not everyone is doing the same thing to survive ie: having two cows and a garden etc. This skill diversity enabled societies to go beyond subsistence farming and go right into artisan coffee shops and space travel. It took awhile. In short: we pay and support people to do things for us that we are too busy to do or simply can’t do. Like hang drywall, fix an aorta and create the “smartphone”. So I ask you to please consider support the local Pittsburgh company THREAD. They are doing things you don’t have time for and can’t do: employ people in third world countries to turn trash into fabric. So yes we can use the same capitalist system of specialization to reorder the flow of cash, opportunity and dignity to individuals. This is important work and really is “maker recycling” on the next level. They are up for a $25K award right now competing against just TWO other companies. 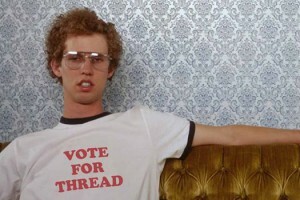 While the other companies are surely good I am asking you to VOTE for THREAD.